After playing his Klein guitar replica for a while, Eric Olds found he was no longer happy playing his Les Paul style Fernandez while seated. The comfort just wasn’t there so he set out to find an alternative while he worked on the Klein’s finish. 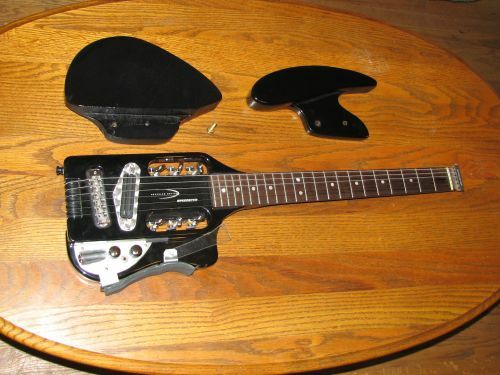 He settled on the inexpensive Traveler Speedster Travel Electric Guitar he had purchased for trips and decided to mod it into a more ergo instrument. I immediately started modifying it – first I put a switch for coil tapping. Then I made a custom jack housing. But it was never all that comfortable to play sitting down. So after my Klein experience, I constructed a fold-out leg support and then a new bolt-on arm rest. Although the Speedster Travel Guitar comes with an arm rest, it’s rather small so Eric came up with the larger replacement seen to the left of the factory arm rest. this approach might be a good one for people to inexpensively try out ergonomic ideas, as the Speedster, even new, isn’t all that expensive and the modifications are much easier than constructing a whole instrument. You could take a similar approach with a Hohner G3T Headless Guitar – the licensed copy of the original Steinberger broom electric guitar. This is really cool, as I’ve noticed that there is a real demand right now for guitars that accommodate feminine needs. They are so close, but ideas like this are a step forward. Really, really cool! thanks for this one. For an excellent example of a guitar designed with the female form in mind, check out Monster Meets the Orchid Bass. Bass guitarist “Monster” takes the Orchid for a test drive. It was built specifically to accomodate a woman’s body but happens to work great for a man’s body as well. i would like to know you you made the custom jack housing? and how difficult was it? i just despise the current jack housing is has now. Yeah, the jack housing was the first thing to bug me, too. I disassembled it, and then used a rod of similar diameter to the jack to bend a piece of sheet aluminum around (in a vise) to create an “inverse stratocaster” jack housing. (Took about three tries, bending the metal, until I was happy with the result.) I also used the original control plate as a pattern to make a new one (Also from a sheet of aluminum) which I wouldn’t feel bad about making holes in for my coil tapping switch and new jack housing. I’d be interested in your thoughts on the Duncan little ’59, and how it compares once you’ve got it in…. The arm rest I thought made it easier to play (without it on it moved around a bit on me) but the pointy part kept digging into my ribs…. Looks interesting. I have a speedster, and I’m ok with the way it’s set up. I never use the arm rest –too much weight for travel. But, I would love to have it even shorter, say a 22″ scale with higher quality components. If anyone wants to build me a custom electric travel guitar, let me know.